When I visited in June 2014, after the terrorists had been extracted from most of Homs, the destruction and vandalism I saw were immense. Even back then, as soon as the terrorists were gone, Old City residents were already returning in trickles to begin the cleanup and think about re-building their lives. Two well-known restaurants, which suffered differing degrees of destruction, have been re-opened. Beit al-Agha, greatly-damaged by the terrorists, is now coming back to life, although repairs are still needed. Al-Bustan restaurant, which was completely ravaged, is fully re-built and open to customers. Photos from al-Hamidiya Community Facebook page show a packed restaurantduring Christmas, and dancing at night. The page shows celebrations in the different churches and streets of old Homs. 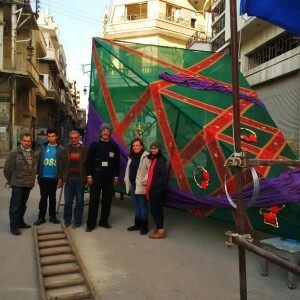 Volunteers who chipped in to build a Christmas Tree and Nativity Scene in Old Homs. “Come, tomorrow at 5 pm and you’ll see the finished display,” I was invited, but didn’t have the chance to get back. However, photos on social media show their creative efforts have paid off: in this square where despair was once deep, hope is flourishing anew. 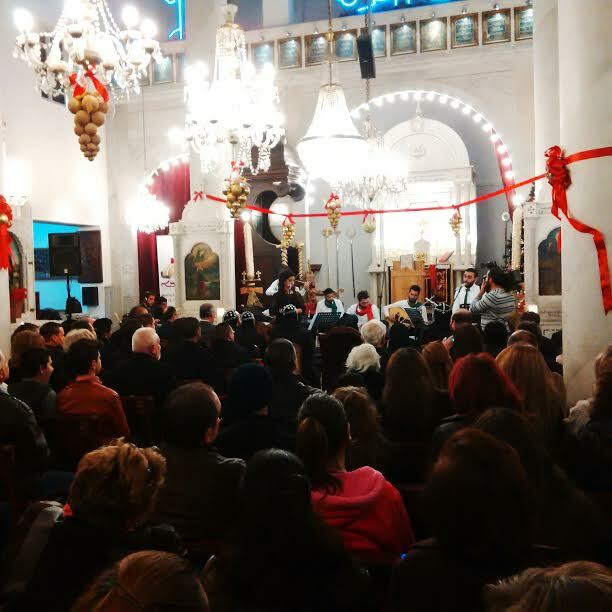 Two kilometres from the front line with the extremist and terrorist groups, the people of Damascus Celebrates Christmas. In order to change the atmosphere, we tried to do something, especially for the younger generation. We had a program in Homs for 20 days before Christmas… every couple of days we had an event for children. One day in Damascus another driver talked about the mortar terrorism which is particularly heavy on Bab Touma (Thomas Gate, in the Old City). “They’re trying to drive the Christians out of Syria. They target Bab Touma because it is a Christian area.” He took out a photo of his son, martyred in terrorist mortars a year ago. For him the terrorism is working. He wants to leave. St. George’s Cathedral in the old city of Damascus. Near Bab Sharqi, I chatted one afternoon with one of the NDF soldiers, Fouad. “We live and die here. But aside from death, there’s no other way we’re leaving here.” Sadly many of Fouad’s NDF friends who felt the same way have indeed been killed, some while fighting terrorists, others by the mortars which terrorists rain down on Damascus routinely. 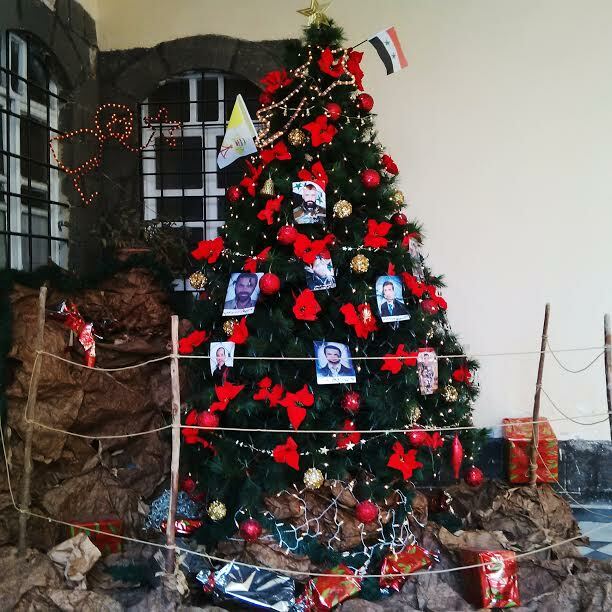 Not far from Bab Sharqi, at the Syriac Catholic Church, a Christmas tree dressed with blinking lights was also adorned with photos of martyred soldiers from the area. 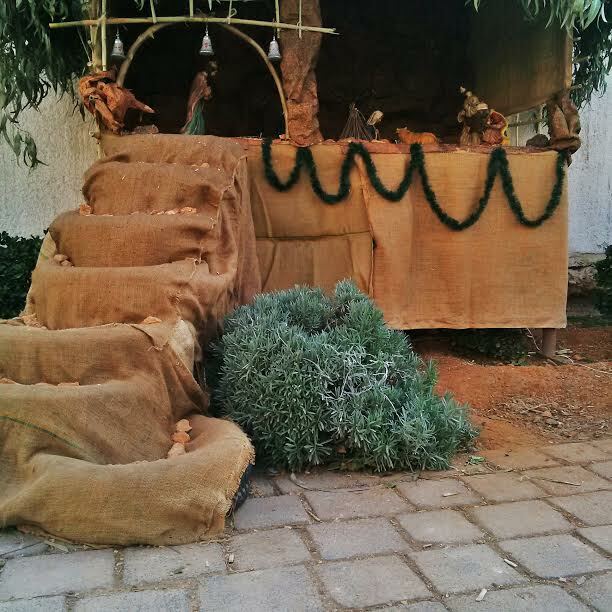 Hand-made nativity scene near East Gate, Old Damascus. 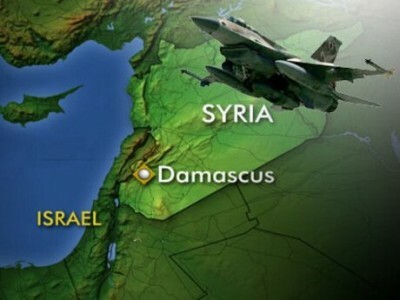 The problem is that those outside of Syria will not believe unless they come and see with their eyes. We can talk all we want but people won’t believe us. But when they come here and see we are Muslims, Christians, Jews… all religions, and no one asks what your faith is. My good friend is Muslim; he sometimes comes with me to church, and I go with him to mosque. I’m a Muslim but I have a Christmas tree in my house, and I always have, since my daughters were born. Now my daughters are in their thirties and their children want Christmas trees. Many of those in Bab Touma (Thomas Gate) celebrating Christmas are Muslims. 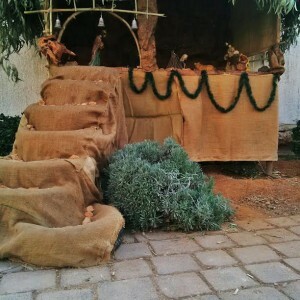 We go to churches, we celebrate Christmas, because our friends are Christians, we are all living together. Society is not divided along sectarian or ethnic lines.